In my last post I looked at Luke 6 and how it relates to kindness. I will now look at the rest of the section which continues to focus on a love for enemies, but also has an aspect that focuses on judgment. Jesus wants us to see that there is a time and place for judgment to be done on earth, but more times than not, judgment should be left in the hands of God. Instead, it is easier and better for us to simply display love at all times rather than trying to judge someone when we ourselves may be found guilty of the thing we are judging them for. Or, perhaps we are guilty of something much worse worse than what we are pointing at. Last time I left off at Luke 6:31, which is the Golden Rule. Verse 32 changes focus to comparing Christians to non-Christians. Suddenly, it seems as though Jesus is actually calling out his followers for being no better than anyone else. He is claiming that they both act the same. Jesus says, what is the point of only loving people who love you back? This is something that all people do, at least for the most part. I am sure we can all think of an example where someone seemed to be a really big fan of us and we wanted nothing to do with them. Perhaps it was that nerdy kid in school who realized that you both had a nerdy common interest that you did not want exposed to the rest of the school. Either way, it remains that for the most part it is easy to love those who treat us well and display love to us back. Being equals with the rest of the people in the world is not what Jesus had in mind. He did not want his followers to be good people in the eyes of the world. He wanted them to stand out and be extraordinary in the eyes of the world. More importantly, he wants his people to be good in the eyes of the Lord. In verse 34 Jesus goes into a topic that is completely foreign in American culture today. He challenges his followers to lend to people without expecting anything in return. Sure, we can possibly embrace the concept of lending to people without interest, but Jesus goes even further and says not to expect anything in return at all. This is not even lending, this is giving without reservation or expectation. On top of all this, we are supposed to do these things to our enemies not just our friends. It is those who are against us that get special treatment. If you are a normal person, you are probably saying to yourself that this is not fair. Why should we be kind and loving to our enemies when they mean to harm us? We want God’s judgment to be thrown at them. However, this is not how God wants things to be. There is a promise for us here and a rather deep point that Jesus is trying to make. If we follow the guidelines that Jesus just laid out for us, then he says we will be rewarded greatly and be considered children of the Most High. All right, I suppose that is a pretty good reward. Like many things in the Bible, we do it because God said so and that is what he wants and our reward is an eternal relationship with him. Fair enough. That should be all that we need. But then, Jesus throws one last piece into this puzzle. He says “because he [God] is kind to the ungrateful and wicked. Be merciful, just as your Father is merciful.” When I read that verse it all makes a little more sense. We are showing love to our enemies and maximum kindness to them because this is the love and grace that God has already shown to us. We were the ungrateful and wicked, and God was merciful towards us. It is only because of this mercy that we can even begin to see ourselves as different than those who oppose us. God wants us to treat our enemies as he treated us before we were in relationship with Him. This, is how we might show the love of God to people who have yet to find it for themselves. They may not ever walk into a church or experience God through some kind of spiritual venue, but they will see us and they will know that we showed them love when we should have (and perhaps even justifiably) shown hate. Before we found God, we were like enemies to Him. The last section of this chapter that I would like to look at deals with the judgment of others. Directly Jesus is saying not to judge or condemn people and we will not be judged or condemned. Additionally he adds that we need to forgive and order to be forgiven, and give in order to receive. Jesus is also telling us that we need to be fair to people. If we try to cheat people then we will be cheated. All these things point back to the idea of loving all people and loving them all equally. 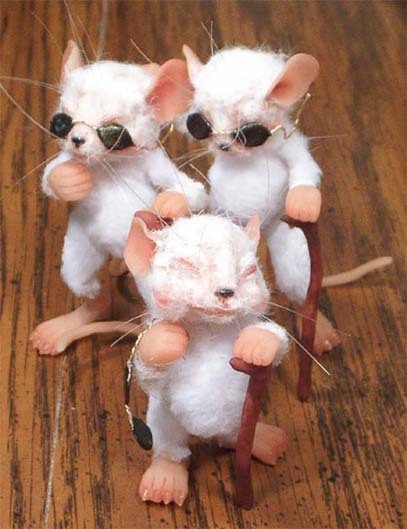 The three blind mice must have had trouble deciding a leader. He leaves them with a parable. This is the parable of the speck of sawdust and the plank. The idea is that you cannot lead someone else to righteousness if you yourself are stumbling. Jesus uses what has become a cliché, “can the blind lead the blind?” He does imply, however, that a leader who is not blind can help people to become like the leader as well. What Jesus is ultimately getting at with the parable is that fact that judgment cannot be cast on others when we first need to cast judgment on ourselves. We cannot tell someone that they need to read their Bible more if we are not reading the Bible ourselves. However, if we have been able to remove the plank, then perhaps we are able to place judgment on others. One problem that I see with this is that we almost always will have some kind of plank in our eye. There is always something that we can be working on. We will always be a work in progress. Hopefully, it is through our love and humility that we will be allowed to help our friends see the speck in their eyes. They may know that we have our own problems, but ideally we have shown them enough love and respect that they can take our judgment (positive criticism) to heart and make changes in their lives. I do not think that the Bible tells us to ignore the problems that our brothers and enemies alike are going through. Instead, the Bible wants us to exercise wisdom and love when approaching the struggles that people have. This is how God wants us to love all people, and this is how we are to cast judgment. Check out the original passage here.